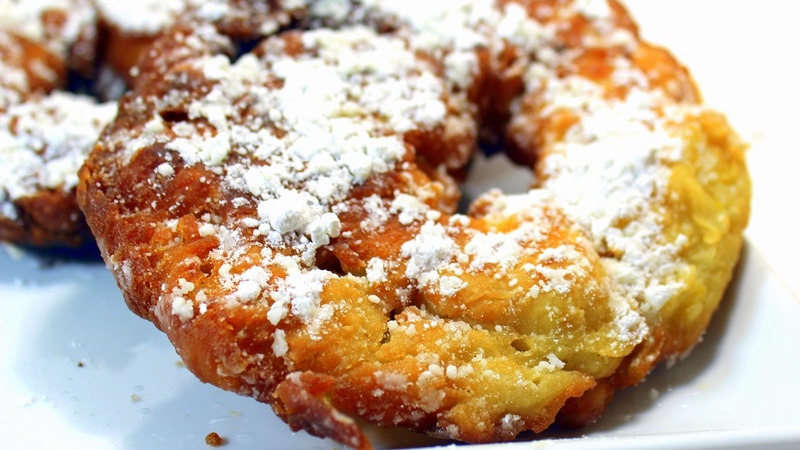 Beignets - The state Doughnut of Louisiana and the memory of an open air market restaurant meal just about every visitor to New Orleans enjoys. But if all you know about Beignets are that wonderfully fun restaurant, you are missing out. 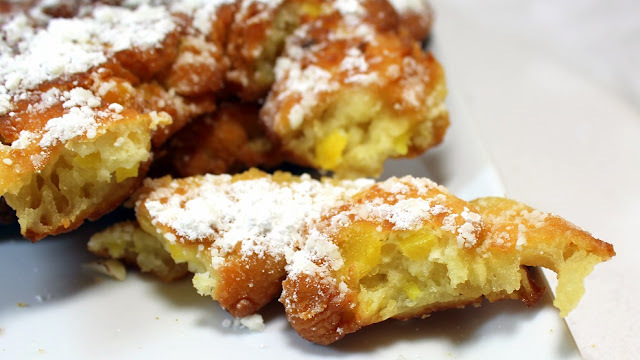 Beignets are made with a wet dough (batter). 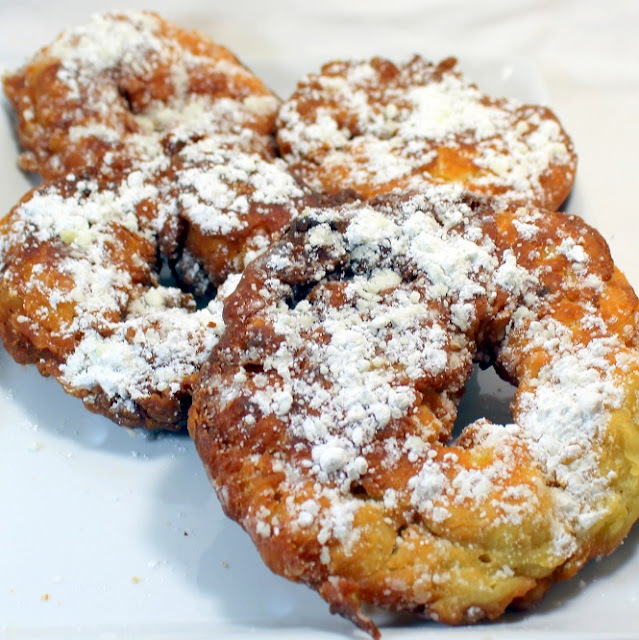 During the frying process, the steam inside the batter makes little air pockets that allows the doughnut to puff up beautifully. 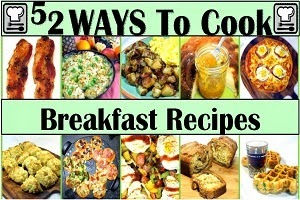 You can add just about any fruit, any little bits that you might have left over from a meal. 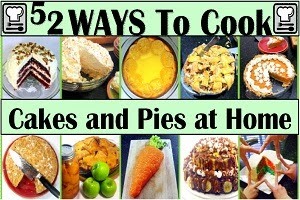 I had just a bit of crystallized ginger left over and a few canned peaches that made these something to remember! Sweet and ginger-y, peachy keen delicious and a wonderful example of bringing home a memory and making it part of your recipe file. VERY easy to DIY, fry and cook by eye, when these have a beautiful golden brown and delicious look... They are done! Add that familiar powdered sugar look and you have your own beignet doughnut fit for your kitchen! In a large bowl, combine the sugar, flour, baking powder, ginger powder, and salt. Whisk to combine. In a separate bowl, combine egg, honey, milk and softened butter. Whisk to combine. Add the wet ingredients to the dry, mix with a wooden spoon. Do not over mix. Add the crystallized ginger and the minced peaches and stir to evenly mix. Preheat the oil for frying in a heavy bottomed frying pan (I like cast iron) to 375 degrees or to a degree that drops of water pop and sizzle when dropped into the hot oil. Drop 1 inch squares of the batter into the oil. Fry for about 2 minutes, flip and fry for another two minutes until both sides are an even golden brown. 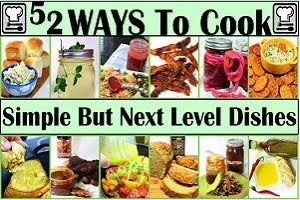 Remove from pan and drain over a paper towel. 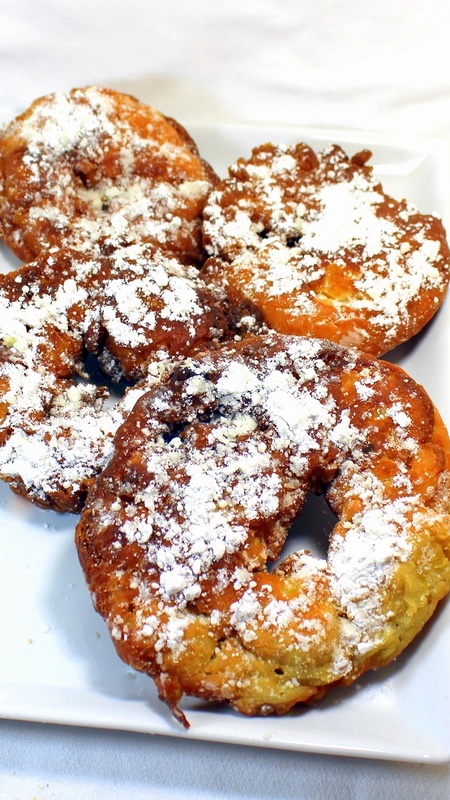 Sprinkle with powdered sugar and serve while still warm... And ENJOY! Oh Boy, these were fun! I have written in the past about my memories of holidays. 50 year old fuzzy rose colored glasses include Halloween and those special houses that make up something special. 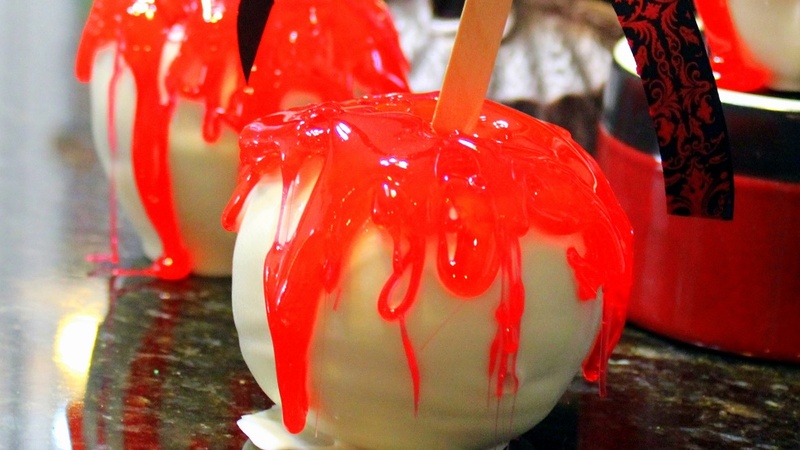 Either trick or treating at Grandma's house, a special neighbor or those rare gems of folks that just make up special items for every kid who knocks on their door, I remember getting a candy apple or two in my day. With the exception of Grandma's house, those rare folks 50 years ago are even more rare now. But I decided to make a quad batch of these, handed a few out to those special neighborhood kids I like and I handed them out to our children's church kids to take home after service. It's a great time of year to be a kid! 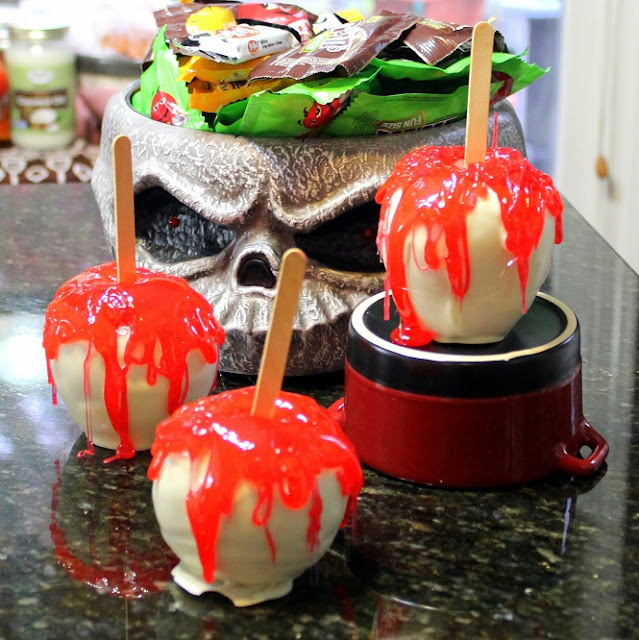 First, insert the Popsicle sticks into each apple. Then melt the chips in a microwave safe bowl, microwave for 20 seconds, stir, repeat as needed until the chocolate is smooth. Dip each apple into the chocolate. You should hold the apples by the stick for several minutes until the chocolate has started to set before setting them down on a sheet of parchment paper or waxed paper. 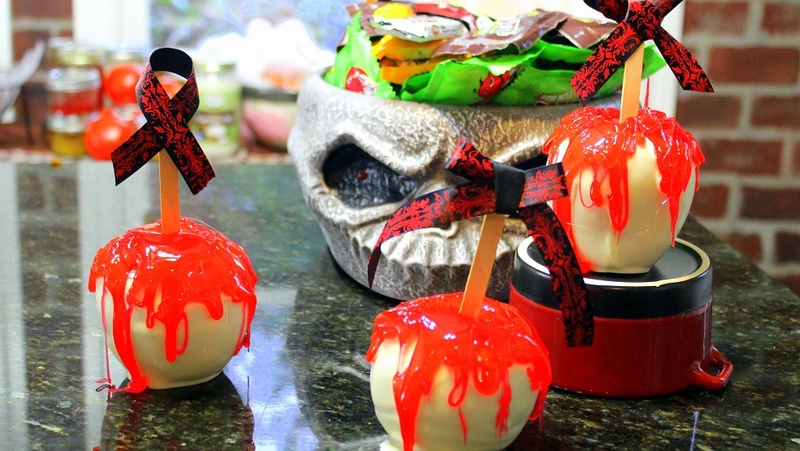 FOR THE CANDY BLOODY COATING.... Combine sugar, corn syrup and water in a bowl then heat until dissolved. Turn up heat and boil until it reaches 290 degrees. 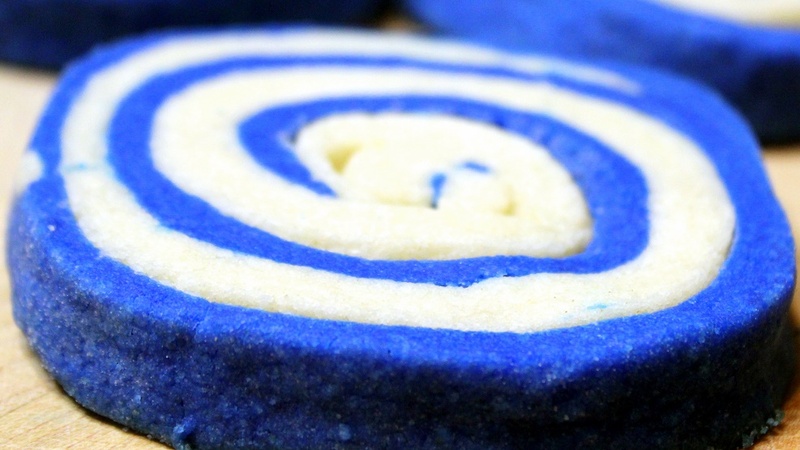 Remove from heat, add food coloring and Peppermint flavoring. Stir to mix until evenly colored. 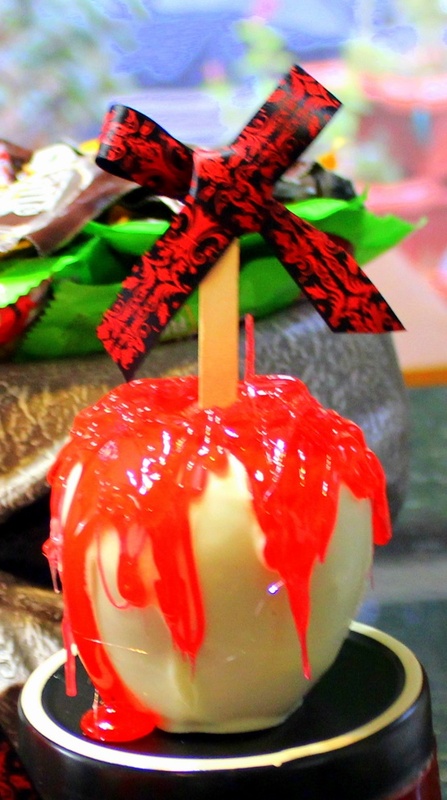 Carefully drip along the top of the apple so that it coats the top and begins to drip down the sides. You may need to reheat the blood as you go once it starts to harden. It's Baseball Playoff time and Royals fever has hit my hometown (Kansas City). BUT in my heart, The team of my youth, the team my daddy taught me to keep score for... My beloved Chicago Cubs are the team of destiny this year (maybe). 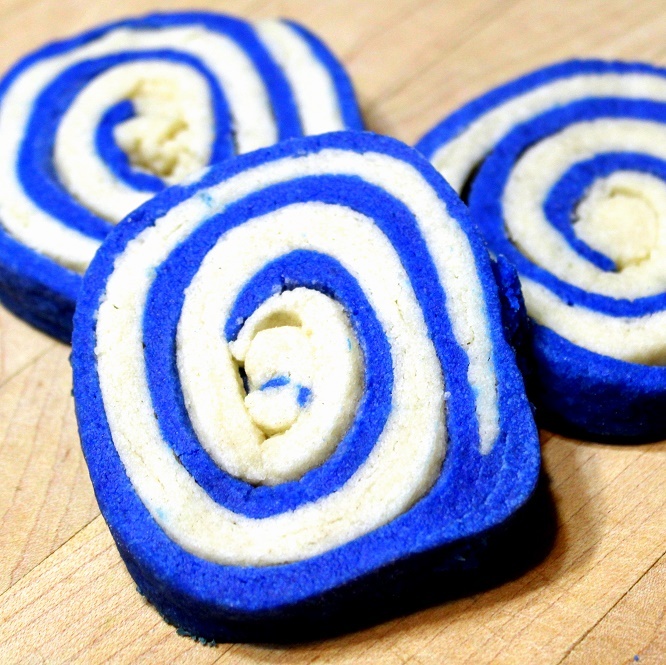 Fortunately, Royal Blue cookies work great for the Cubbies and the Royals so I can share these at my watch parties with both loyalties. These are deceptively easy. Make two batches of dough (or a single and divide), color one half, sandwich together, roll up, slice and bake. 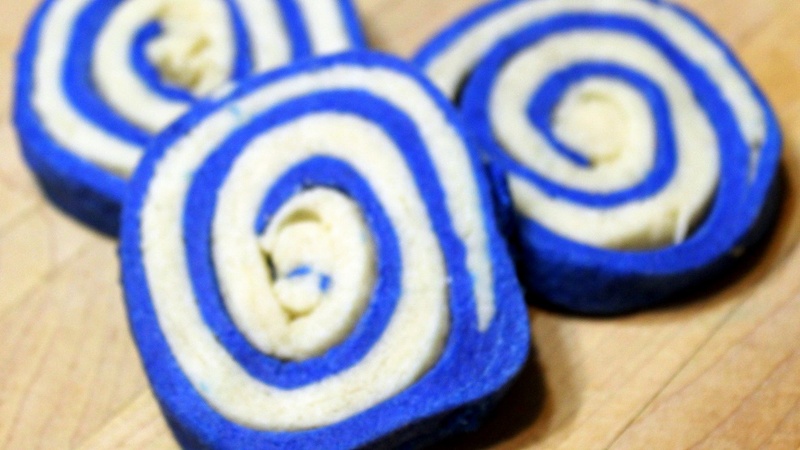 The cookies come out soft and delicious. They are a basic butter sugar cookie recipe. 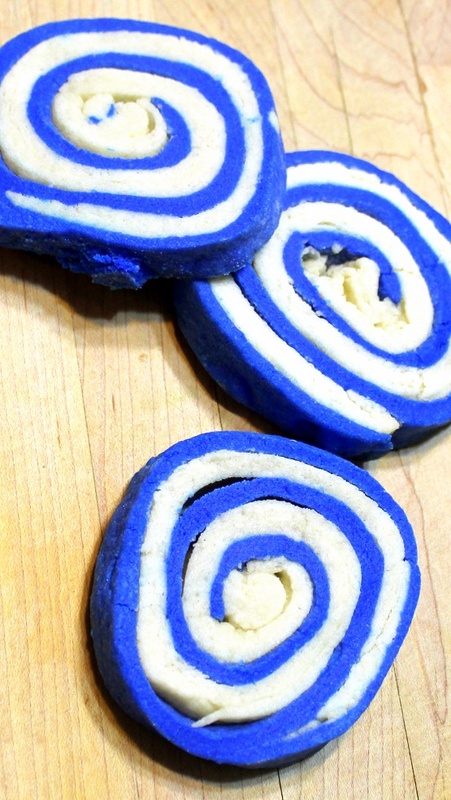 But the colors... Royals Blue ... "Let's go Royals"
Cubbie Blue ... "Go Cubs Go"
In the bowl of a stand mixer, cream together the butter and sugar until creamy smooth. Add the egg, baking powder and vanilla extract and mix again until smooth. Add the flour one cup at a time, mixing between additions. Add additional flour a couple TBS at a time if the dough is too sticky. Divide the dough, using a top quality food dye (Wilton Food Coloring works best for me), color half of the dough in Royal (or Cubs) Blue. Add drops slowly, easy to darken, very hard to lighten. 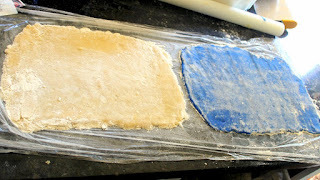 Once you have half the dough colored as you like, refrigerate both halves to firm up for 1 hour. 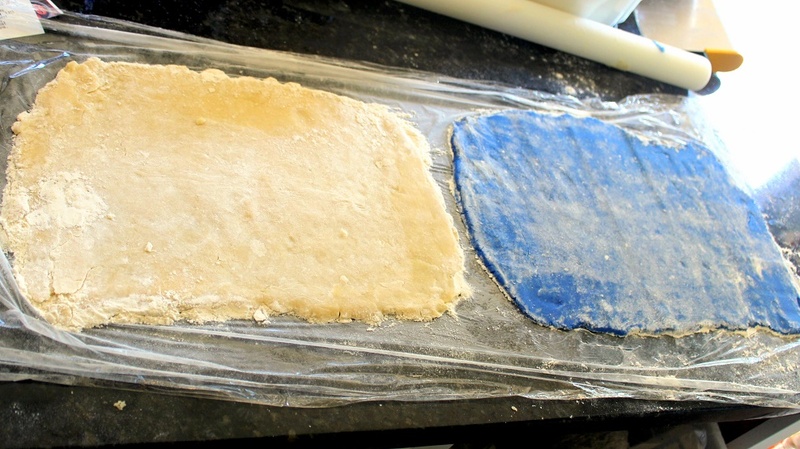 Once the dough is firm, roll each color out to about 1/2″ thick. Stack the doughs on top of one another. Starting on one of the long sides, roll the dough all the way to the other side to form a log. Wrap in plastic wrap and allow the dough to set for another hour in the refrigerator. Once the dough has set, slice into half inch thick rounds. 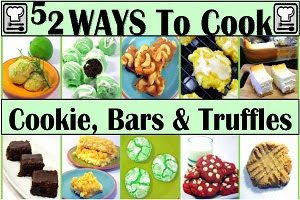 Arrange on a parchment paper lined cookie sheet. Bake in preheated 350 degree oven for 10 minutes. Allow to cool on the cookie sheet for 5 minutes then transfer to a wire rack to cool completely. Serve room temperature at your Royals (or Cubs) Watch party and ENJOY! Aren't these just about as cute as it gets? I made these for our Children's Church snack time and they were the hot of the day! I made sure each of the kids got one to eat and an extra one to give to their parents. Of all the snacks and clever presentations I have ever made, this was the one that everyone wanted to know the "secret". Not much really and incredibly easy considering the huge payoff. 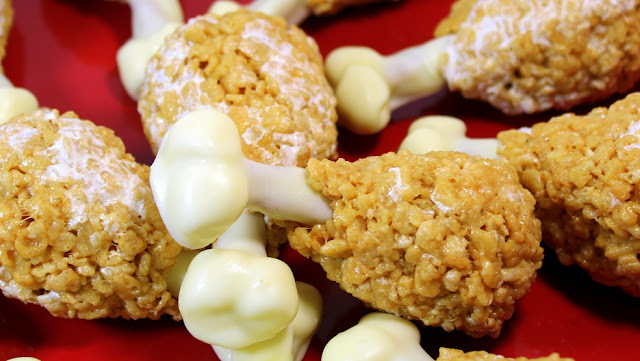 Stripped to the basics, it is Rice Krispie Treats wrapped around a pretzel rod with one end coated in white chocolate. But it is the knuckles that are the clever part... Look at the photo below, bottom right side... see the mini marshmallows? What kid doesn't like the idea of eating a turkey leg??? Well, the secret to the presentation is the clever knuckle joint at one end made of mini marshmallows... Just slice them half way through and use the sticky parts to adhere to the pretzel just before you dip. 2 Cups White Chocolate Melting discs, melted in microwave at 15 second bursts, stir and repeat until just fully melted DO NOT OVER HEAT. FIRST, PRE ASSEMBLE THE BONES... Lay out a long sheet of waxed paper. make a slice in each of the miniature marshmallows half way through so they can be opened like a book. set aside for the knuckle of the bone. 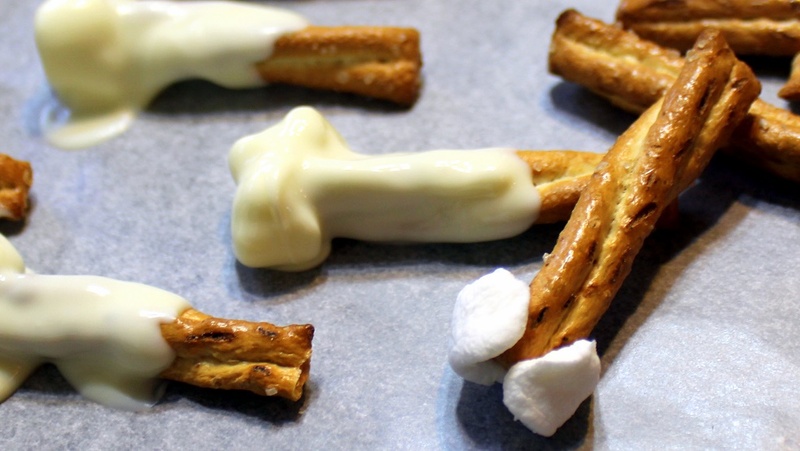 Add two of the marshmallows to one end of each pretzel rod. Open them like a book so the sticky insides adhere to the end of the pretzel. Firmly press together. NEXT, MELT THE WHITE CHOCOLATE MELTING DISCS... In a microwave safe bowl, melt the white chocolate melting discs according to package directions. I do the 15 second microwave burst method, stirring in between each burst. Be careful not to OVER COOK, white chocolate burns. NOW COAT HALF OF EACH PRETZEL (the half with the marshmallow knuckles). 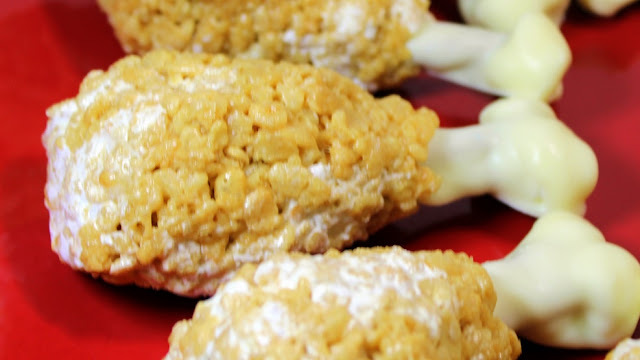 With the chocolate wet and creamy, dip the pretzel and "knuckle" and up the rod about half way (the remaining will be covered by the rice krispie treat. Holdup until the chocolate starts to set before you set this down on the wax paper. The longer you hold, the better the knuckles will look. Repeat until all 24 are coated. In a LARGE Microwave safe bowl, add marshmallows and butter, zap for 30 seconds, stir to mix, repeat until marshmallows are just melted... Do NOT over heat. I zapped three times, 1 minute 30 seconds total. Stir to mix and combine. Add the Krispie Rice Cereal to the marshmallow goo and mix. Fold until the krispies have also become colored. Spread in an even layer about 1 inch thick in a waxed paper lined jelly roll. Allow to cool for a 1/2f hour until the treats are soft but not too sft. no longer tacky to the touch, but still pliable. 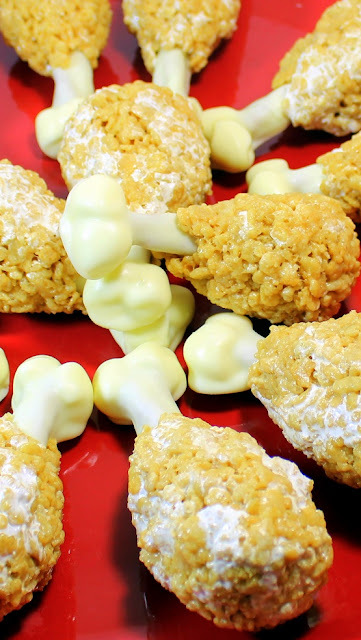 NOW MAKE THE TURKEY LEGS... Take about 1/2 Cup of the Rice Krispie Treat and fold around the uncoated part of the Turkey Bone, pressing to form the look of a turkey leg, leaving 1/3 of the bone uncovered by treat and the remaining tapered to form a rounded top... Like a Turkey leg. Set them back on the waxed paper to fry and properly harden. Serve to amazed kids and adults alike and ENJOY! As I am writing this I am basking in the glow of October baseball unlike anything I have ever had in my life. Last night, my beloved Chicago Cubs won their first post season series in Wrigley Field in over 100 years... Indeed, party like it's 1908! 50 years of being a Cubs fan and I was reduced to a few tears as I watched the celebration (and wasn't it especially sweet that they beat the hated Cardinals to boot!). Tonight, my relatively new beloved home town team (for the past 18 years) Kansas City Royals have an opportunity to move on and win their post season series. 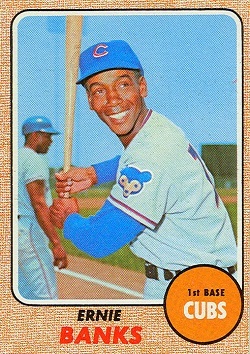 50 plus years ago I was a wee lad loving the Cubs of the 60's. Living just under 200 miles away from the friendly confines I even have a few memories of attending some games live! The line-up included some of the greatest ball players of all time, Ron Santo, Don Kessinger, Randy Hundley, Fergie Jenkins and possibly the greatest player to ever wear the uniform... ERNIE BANKS! Ernie is one of those rare childhood heroes who never disappointed. He played to win as much in his declining years as in his glory years. He set record after record. His personal life was a shining example of sportsmanship and enthusiasm. He knew he had fans that read about his every move and he led his life accordingly. My hero then and still now. He became famous for enthusiastically saying, Let's play Two". Back before the multi million dollar salaries and players changing team loyalties with nonchalance, Ernie loved the game. And I know there are still a half dozen teams in contention for a world series birth, but for me, this would be the best October ever if my Cubbies met my Royals in the Fall Classic. 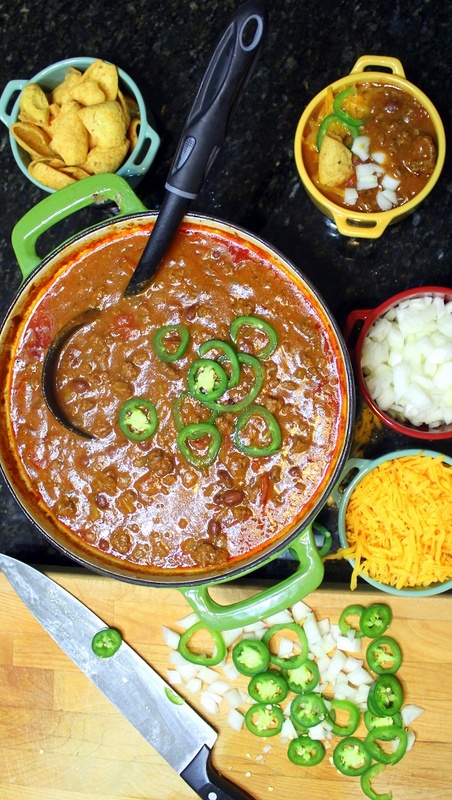 Ernie Banks, "Let's Make Two Pots" Chili! A)... the chili is that good that you need two pots to avoid the disappointment of being finished prematurely. B)... You may as well make extra since you now need to have a bowl every time the Cubs (or Royals) play in the post season. Tastier superstition than not changing your underwear. 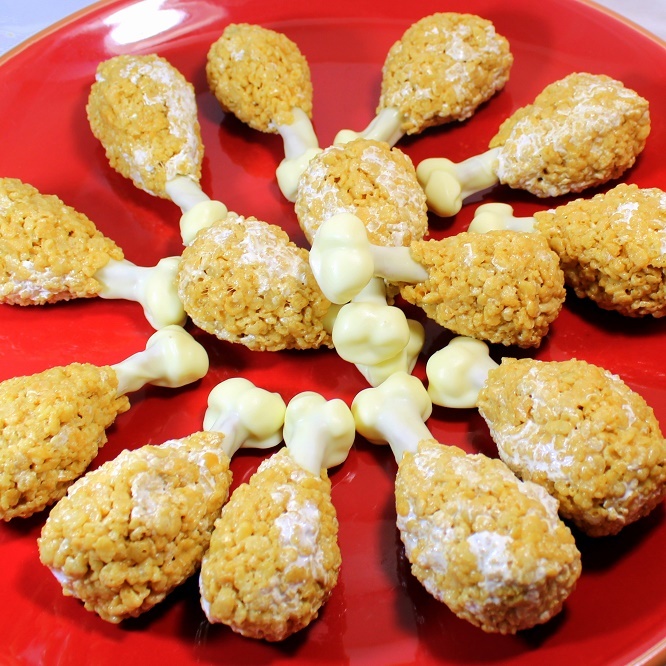 OK... enough of my October fantasies, let's talk about this recipe. 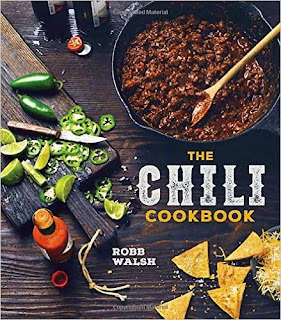 Recently I received a copy of The Chili Cookbook: A History of the One-Pot Classic, with Cook-off Worthy Recipes from Three-Bean to Four-Alarm and Con Carne to Vegetarian ! And sure enough, filled with Chili recipes. 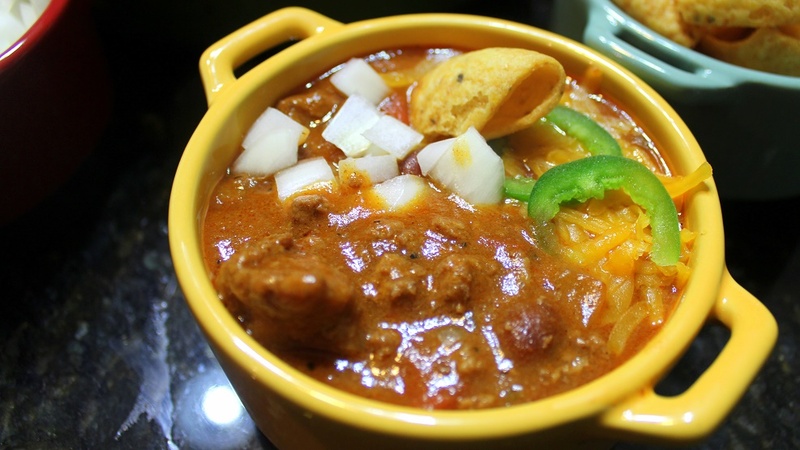 Chili is one of those dishes that means different thing to different people worldwide. Robb Walsh, the author, researches and explains many of them. 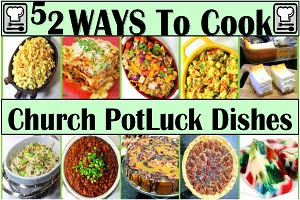 From the chuck wagon roots of the 19th century cattle drives in Tex-Mex country, to world wide origins of Hungarian goulash and Greek recipes. 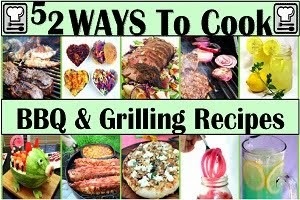 Even featuring the Burber Pirate recipe for Tagine. 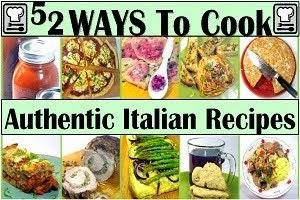 All lay claim to the "authentic" recipe and all are right. Me, I love the chili of my youth, the chili of central Illinois... the chili of ground beef (who could afford steak in their chili?) and beans. Talk to the authentic chili people and they would be vexed by those words. In Texas my mama's chili would not even be considered chili. But in Illinois we would not have ever been offered steak and spices chili that wins all the contests in Texas. This book features all those recipes and more and explains why your chili is indeed authentic. The prose is rich in history and traditions. Century old stories and modern twists get equal respect. 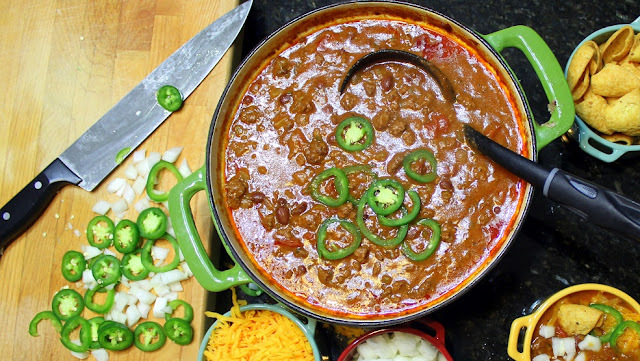 Read a few chapters and you get caught up in the glory that is... CHILI! 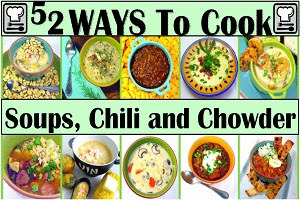 The recipe (keep scrolling, it's here), I chose to make from the book (one of many I have marked to try) is actually called "Illinois Chilli with Two "L's"". 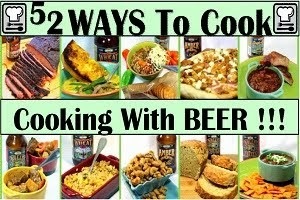 Has lots of different seasonings and pays homage to my mother's recipe... ground beef, beans and all! It is also comforting, nostalgically delicious. the perfect food for the boys of summer to celebrate the last few days in the sun. Cubs and Royals all the way (you heard it here first)... Go ahead, you'll need to make a double Pot! In a large Frying pan, brown the ground beef, reserve the renderings. Meanwhile, in a VERY LARGE or in two just large dutch ovens or chili pots, combine the Onion, Celery, Chicken Stock, Tomato Juice, Garlic Powder, Chili Powder, chili Powder, Cayenne Pepper, Paprika, Cumin, Oregano, Black pepper, Brown Sugar, Beans with liquid and Tomatoes with liquid, Stir to blend. Add the Ground beef and again stir to mix. Cover and simmer for 20 minutes. Warm the rendered fat from the ground beef, add the flour to the renderings and stir to mix. Continue to stir and heat over medium low heat for about 5 minutes until a thickening roux forms. Check the Chili, taste. Add additional seasonings (more Chili Powder, Cayenne pepper or black Pepper if the chili needs to be spiced up) to taste. Know that as the chili continues to simmer (or sits over night) the spices will intensify. Stir in the thickening roux to make a thicker gravy. 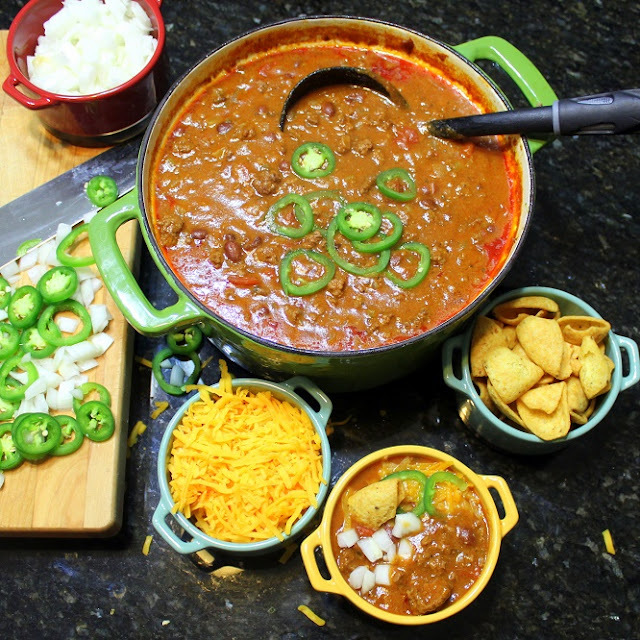 Serve HOT with dollops of Sour Cream if the chili is too spicy, extra cheese, raw onion, crackers (I like Fritos with this) and Jalapeno Peppers and ENJOY! Oh Boy I love this pie... No frosting, instead a chocolate poured Ganache for a powerful punch of sweet chocolate flavor. 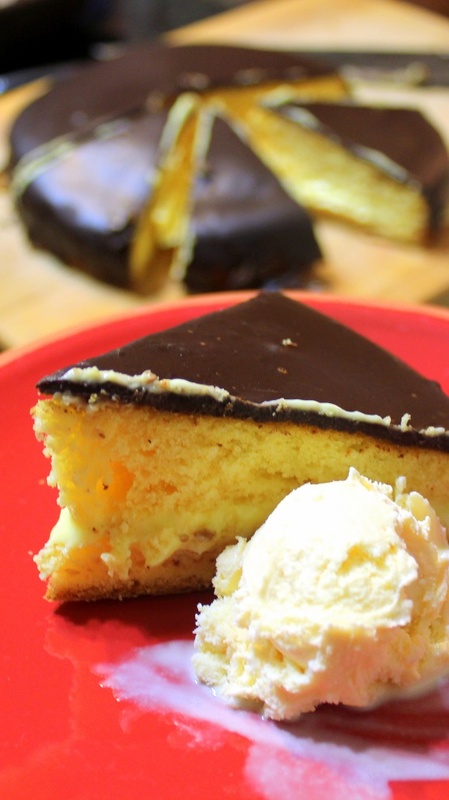 But for added moisture and flavor, there is a center layer of vanilla custard or pudding. A wonderful name (although this is actually a cake and not a pie at all... but I digress), that just gives off an illusion of difficulty that only store bought bakery desserts can achieve. Cut the cake in half. Use a long bread knife, cut carefully and it works just fine. Only tip would be to chill the cake (firmer). Take a close look at the image to the left. Use a wire rack and pour the chocolate over a cooled cake. 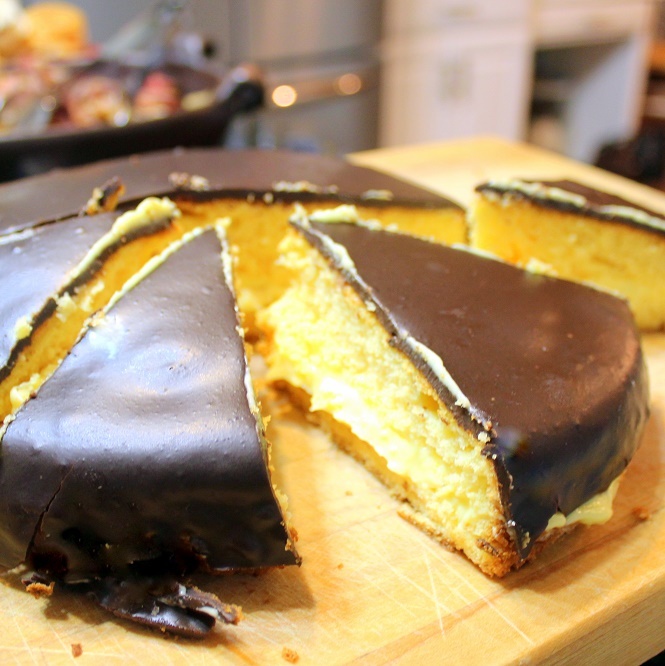 sure, some will fall through the rack, but it is the easiest way to get that smooth poured on look that this cake traditionally has. And that;s it... A real crowd pleaser in presentation, taste and VERY VERY EASY! Prepare Cake mix as directed on box. Bake in a prepared (butter and flour bottom) 9 inch springform cake pan according to the directions on the box. Cool in the refrigerator for 2 hours. 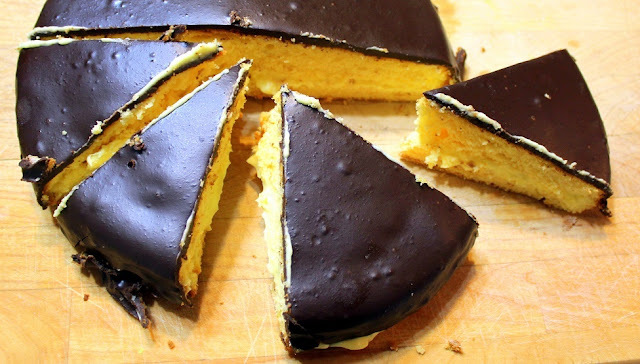 Slice through the center of the cake, making a top half and a bottom half. Prepare the pudding, using half of the liquid (milk or half and half). This will make a more solid pudding center. Evenly spread the pudding on top of the bottom half of the cake, top with the top gently. Refrigerate for another 2 hours. 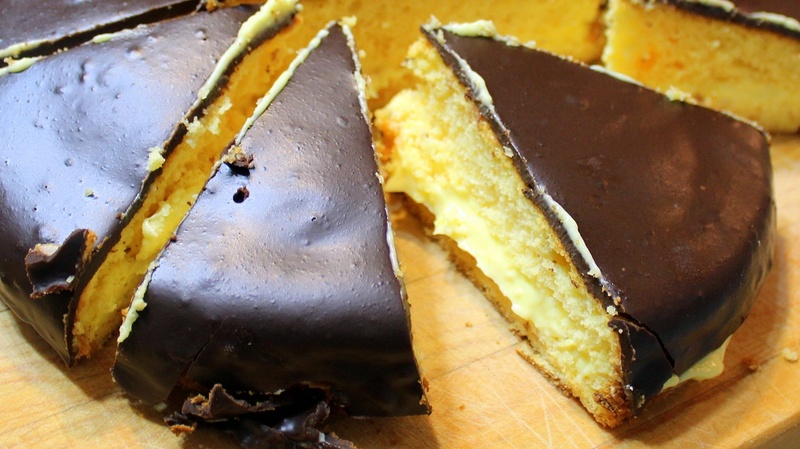 Prepare the chocolate Ganache - In a microwave, melt chocolate and butter; stir until smooth. Stir in confectioners' sugar, vanilla and enough water to achieve a thick glaze. Allow to cool for a few minutes. 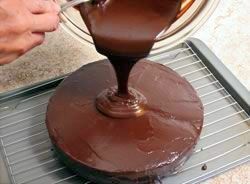 Spoon chocolate glaze over the top, allowing it to drip down sides of cake. 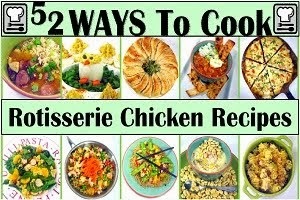 Refrigerate for another two hours or more. And since this recipe features a cake as an ingredient, t has also been added to my growing list of "52 Cakes and Pies at Home"!